CERTIFICATIONS: Hank is working on his HRD certification for land searches. Laura is President and one of the founding members of NJ Rescue & Recovery K-9 Unit. She has been a SAR dog handler since 1997. Hank is her fourth SAR dog. CERTIFICATIONS: Havyk is certified in wilderness air scent. Havyk also has his Canine Good Citizen (CGC) , Canine Good Citizen Advanced (CGCA), Canine Good Citizen Urban (CGCU) and his BH in IPO. Stephanie joined the NJ Rescue & Recovery K-9 Unit in 2010 and serves as the Vice President and Training Director of the Unit. CERTIFICATIONS: Ryot is working towards his trailing certification. Ryot also has his Canine Good Citizen (CGC) certification. CERTIFICATIONS: Zeke is working on his HRD certification for land searches. Donna is one of the founding members of NJ Rescue & Recovery K-9 Unit and serves as Treasurer of the unit. She has been a SAR dog handler since 1989. Zeke is her fourth SAR dog. CERTIFICATIONS: Emma is certified in wilderness air scent. Emma also has her Canine Good Citizen (CGC) certification. Niko is working on his certification in wilderness air scent and urban search and rescue. Keith has been with NJ Rescue & Recovery K-9 Unit since Feb 2014. CERTIFICATIONS: Solo is working towards his trailing certification. CERTIFICATIONS: Hexxus is working towards her wilderness air scent certification. Hexxus also has her Canine Good Citizen (CGC) certification. 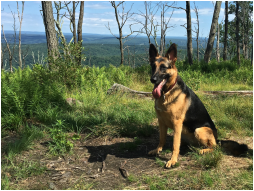 Maria has been with NJ Rescue & Recovery K-9 Unit since 2016. CERTIFICATIONS: Takoda is certified in wilderness air scent. Laura is President and one of the founding members of NJ Rescue & Recovery K-9 Unit. She has been a SAR dog handler since 1997. Takoda is her third SAR dog. Gylla has been involved with NJRRK9 since 2008. She has certified a dog with NJRRK9 in wilderness air scent. As an Associate Member, Gylla not only serves as the occasional "victim" but also provides the Unit with training maps as well as assistance in updating Unit documents .